Yes, snails. If you thought a snail couldn't blow your mind unless it was dipped in butter sauce, then obviously you have never met a cone snail. Yet beneath that fancy facade is a venomous and deeply complex predator. To compensate for, um, being a snail, cone snails have developed a lethal arsenal for capturing quicker prey. Their fine-tuned weapons include deadly venoms, harpoon-like teeth and various techniques for laying biochemical waste to their targets of choice, which, depending on the species, are fish, worms or other snails. Or maybe you, if you're not careful. This unexpected dark side is definitely their most fascinating aspect. In the 1950s, Alan Kohn pioneered the study of cone snail venom as a Yale University graduate student, and basically everything researchers have learned since only confirms the general badassery of these marine invertebrates. So ... here are our five favourite reasons to be obsessed with cone snails. Each of the roughly 700 species of venomous cone snails is a brilliant pharmacist, producing as many as 200 unique toxins to inject into unsuspecting fish, worms or mollusks. These so-called 'conotoxins' mainly target the nervous system but do so in extremely specific ways, which become obvious when they are singled out. Various conotoxins can elicit a range of reactions in lab mice, including (but not limited to) sleepiness, jumpiness, depression, head-swinging, scratching ... and many other unpleasant or ridiculous behaviours to experience before theoretically being swallowed whole by a snail. However, the real power of these conotoxins lies in their synergy: cone snails release them as fast-acting mixtures, specially mixed and modified for particular purposes. 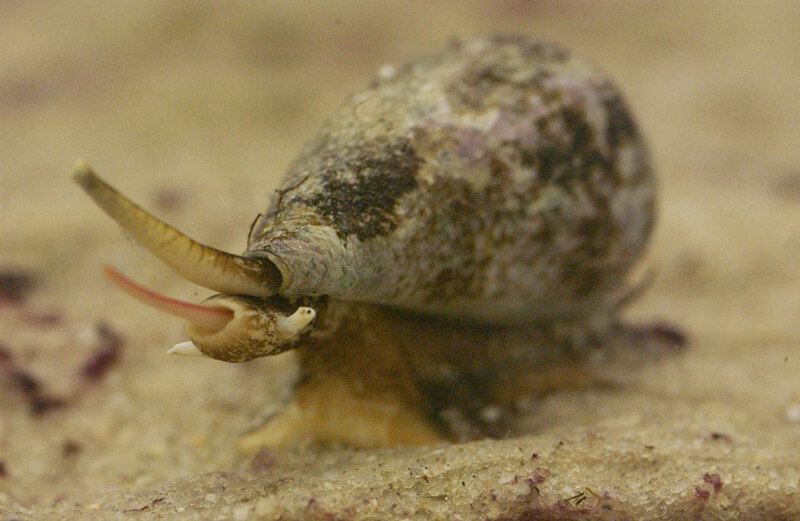 Cone snails deliver their toxic cocktails by injecting the venom through a hollow, harpoon-tipped tooth. Afterwards, they toss that tooth like a disposable hypodermic needle because they're developing 50-100 more needles inside a sac connected to the venom gland. So don't touch them. One particularly potent species, the fish-hunting C. geographus, has killed at least 18 people and is lethal in 67% of untreated cases. Fortunately, the odds of meeting a deadly marine snail are low. Cone snails are nocturnal, mostly hiding in the sand and rocky terrain of tropical coral reefs. If you actually encountered a live one, it would probably retreat into its shell unless you – stupidly – provoked it. Again, don't. Researchers are studying cone snail venom for insights into neuroscience and medicine. As a result, multiple drugs are in various stages of development and clinical trials, with applications ranging from chronic pain to epilepsy. One notable example is the drug Prialt, an approved painkiller and alternative to morphine, originating from a venom component of Conus magus. In fish, the snail's intended target, this compound causes paralysis by blocking the release of key neurotransmitters to muscles. In humans, however, it blocks the spread of pain to spinal cord nerves, providing sweet relief. Some venom cocktails are for dinner, others for defence. One type of mixture, the 'motor cabal', prevents fish from contracting their muscles, inducing the horrific-sounding 'flaccid paralysis'. Another concoction, the 'nirvana cabal', sedates fish, placing them in a drugged-up state. University of Utah biologist Helena Safavi-Hemami and her fellow researchers recently discovered that the nirvana cabal of certain fish-hunting cone snails also includes the hormone insulin. But not snail insulin – fish insulin. By releasing this important energy-regulating hormone into the water near passing fish, snails can deliver a blood-sugar crash, allowing them to more easily nab impaired fish with their net-like mouths ... before, of course, stabbing them with paralysing venom and swallowing them whole. But the researchers attempting this definitely use protection. Seriously, they use condoms (the non-lubricated ones). Biochemist Jon-Paul Bingham of the University of Hawaii at Manoa first developed this technique for extracting the valuable venom of cone snails. 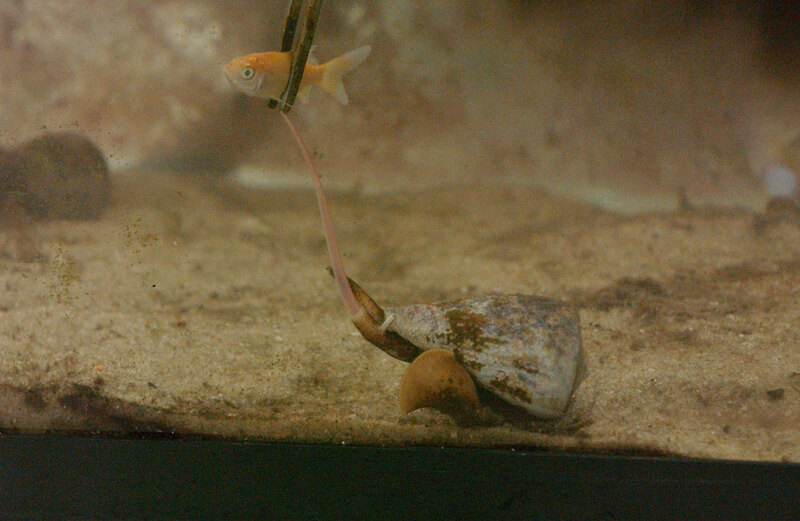 He lures cone snails into stabbing at dead goldfish dangled in front of condom-covered test tubes, where the snails release their venom mixtures in all their complex glory. To what end? Bingham's lab is now reviewing cone snail venom's potential as a super-specific, biodegradable pesticide. Have you ever seen a nudibranch heart beat? We hadn't either! Check out what makes these beautiful sea-slugs tick. A small spotted catshark emerges from its egg case in the Balearic sea.